It’s very simple actually. The receiver part of the adapter looks just like a gooseneck hitch. When you need to pull gooseneck trailers, just put the adapter on the 5th wheel hitch rails and bolt it down. After that, hook the trailer couplers with the tool gooseneck receiver and you can start towing the trailer. When the truck arrives at your destination or you want to use the 5th wheel hitch again, casually remove the adapter. Both the adapter installing and removing process require little time to accomplish. There are many types of adapters around with a variety of specification. Some are manual adapters that require you to go to the truck box to latch/unlatch the trailer couplers by yourself. Others are modern designs with the option to stay inside the car and remote control the latching mechanism. But no matter what you pick, it must be appropriate for your truck body and the trailer. Since gooseneck and 5th wheel trailers are mostly, if not always, heavy and bulky. An ill-suited adapter may reduce the truck stability which can lead to accidents. For the cost, often at 400 – 500$, the adapter is relatively affordable. Manufactured out of solid steel and act as an important link between your truck and the trailer, it’s totally worth the cost. Therefore, if you want to get a 5th wheel to gooseneck adapter, you better make sure it sufficient for the task at hand. You need to collect certain measurements about the truck dimension and the clearance before deciding on what is the correct adapter size. If the purchase is wise and logical, your towing trip will be a smooth and uneventful experience. To decide whether you can use a straight adapter or not, the first thing to do is obtaining the trailer width measurement. Next, divide that number by two and write down the result. Now you need to measure the distance between the back of the truck cab to the adapter planned position. If that distance happens to be at least 4 inches longer than the first result, you can use a straight adapter here. The clearance is good enough to allow an unobstructed installation of the adapter. Trailer couplers would also have a stable and reliable connection. For a quick example, let’s assume that your trailer width is around 96 inches. One-half of it would be 48 inches. Add in 4 inches and now you have 52 inches. If the measurement from the gooseneck receiver to the truck cab is 52 inches or more, a straight adapter can be installed. If you don’t have enough clearance here, an offset adapter would have to do. The offset of the adapter can lengthen the clearance by 7.5 – 8 inches, depending on the type and brand. In order to decide the appropriate height for the adapter, get the car and the trailer to park on even ground. If you are having a problem then a jack would be useful here. When the trailer appears to be steady and level, back the truck toward it as if you are about to connect them together. After that, get to the truck box and measure the gap between the top of the gooseneck ball to the pin box (It’s not the kingpin). The measurement you get from this is the height of the adapter you should have. To achieve a safe operation, also ensure a minimum distance of 6 inches between the trailer overhang and your truck side rails. These measurements should give you the general idea of the adapter height. The tallest height you can get with the adapter is the cushioned version at 16 inches. Some of the adapters also offer adjustable height to be more versatile to your needs. 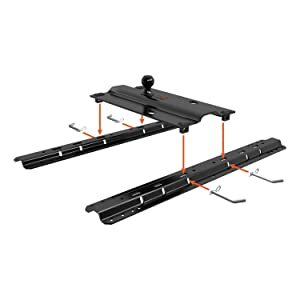 This is a product that comes with a traditional built and able to fit all standard 5th wheel hitch model. With its small size and lightweight, this adapter can support an impressive trailer gross weight of up to 25,000 lbs. The installation and removal process can be done relatively fast as usual. Utilize a carbide coating, the adapter can withstand a tremendous amount of rust, scratching and UV light. And if you still have any worry, a 7-year warranty will surely give you peace of mind. That is a proof of the manufacturer confidence in this product. And that would be most of the stuff you need to know about 5th wheel to gooseneck adapter. Fairly easy to understand, right? With this adapter, you don’t have to replace your 5th wheel hitch to a gooseneck one so you can tow gooseneck trailer. Require only 15 – 30 minutes to install or remove, the adapter is a quick and cost-effective solution to when you need to tow something. You can also get a suitable adapter to your truck too if you follow the instructions above. No matter if it’s gooseneck or 5th wheel, you can easily tow trailers with either of the hitches.